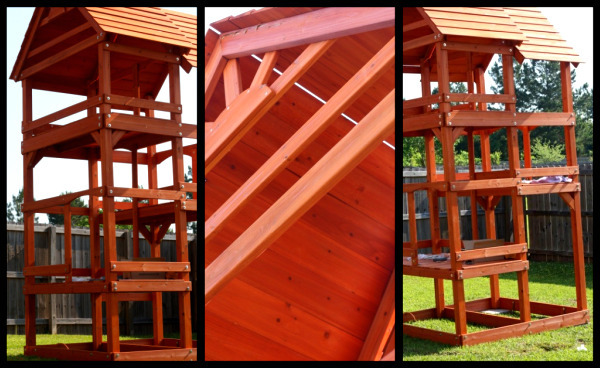 We purchased the Highlander Deluxe Cedar Playset with Slide. We asked my FIL to help us out putting it together and he agreed (of course..thank you!) but I think we all underestimated the serious engineering that went behind this swingset. Tips: Make sure you read through the instructions and note all the tools you need. Do not think you can “make due” with what you have. Get the tools or borrow them or you will hit a point where you cant go further. My DH recommends an electric screwdriver (Two of them for two people), if they have it, electric Ratchet attachments, drill, 9″ ladder, and LOTS of water. Day #1: Separation. We got started at about 3pm on Saturday. The first thing you have to do is empty the boxes and sort the wood into the respective areas. H goes with H, M goes with M, etc. It took about an hour to unload and separate all the wood properly. Step #2: Building the frame. This took about 2 more hours. Its funny because the instructions say to have two “moderately” skilled people. Yeah, I’m not sure it matters. Understanding the instructions, finding the right hardware, wood, it just simply takes time. Unfortunately we had to build a section of the frame 3 times because we thought we had it on backwards once we had it up. Not all of the wood is predrilled, so you do have to do some of it yourself. This is a cause for confusion. We didn’t actually do it wrong the first time, but it took taking it apart to realize it. Step 3: We realized about 6pm that we had to go get levelizers for the swing set before we could go further, so the day stopped at 6pm for a trip to Home Depot. Day #2: Day started at 9pm. We had to levelize the swingset with paving stones and then add reinforcements and anchors. The instructions would have you add the anchors in the ground and push the swingset to it, but its impossible because it would mess up the work you just did on the level. We used some improvisation here. Day #2: 1pm : By now everyone has been working in the 90 degree heat for 4 hours. A few tips...buy your swingset it the spring months, like Feb-April. Putting it together outside right now is much more taxing then it has to be because of the heat. A few problems we have had: The instructions tell you when and where to put a board up but often don’t tell you which direction to have the holes facing. There have been a few times where boards have been put on backwards and have had to be pulled out. Maybe look ahead a few sheets to see if there is something that is being screwed on during another step before you commit a bolt to it. Its time consuming, but saves you the undo and redo. The decks went on pretty fast compared to yesterdays building and we have some renewed strength as it now looks like progress is being made. Roofing is up…You are going to need a tall ladder for this step. You can only add so many planks from standing on the top before it all has to be done from the outside. My FIL had to go home at 230, so that left Chris ready to take a break and get out of the sun. He picked it up at 4pm and a neighbor came over for an hour and they worked a little more with the framing around the swingset. The day ended at 6pm for dinner. The thing is that the heat is much lower at the end of the day, but by then you are so exhausted that you cant lift another screw. 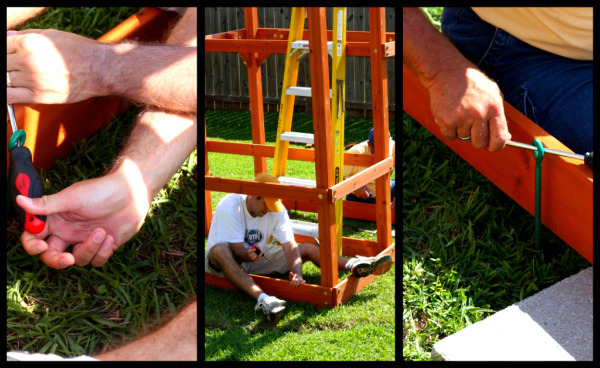 You can continue this post by following to the next one at Highlander Swingset Assembly Post, Day #4. There are degrees of difficulty with boxed playsets, as the Highlander is. I would definitely recommend hiring a professional if you have the $$ to install any playset, if for no other reason than the safety factor. My husband and I are unboxing this playset and saw in the instruction manual that several tools are needed including a torque bit. After reading the instructions, it appears a though you really just need a level, drill, 3/16″ bit, and Phillips head bit. I know it has been a while since your assembly, but do you remember needing that item. I am just trying to avoid buying something we may not need. Also, it appears as though the article ends after Day 4 and I can’t find anything beyond that. Is there another article past Day 4? It has been a bit, but I will ask my husband when he gets home from the beach today! Tiara, also I looked to see if I had other posts on it and I cannot find anything past that day. I think I was just blogging it for fun (it wasnt officially for the company or anything). I swear I did a final update but it may not have been in that month. If I find it, I will reply back w/ the link! just curious as you are coming up on 2 years. how has the wood held up? splitting/bending/bowing/warping/fading. strong and durable still? Just curious how your playset has held up.. since it’s been some time since you posted these. Is it still strong and durable? Fixing to buy one for my 3 boys. Any thoughts or suggestions? Its still going strong! My only tip is to make SURE its level and you do the anchors. Also, the three levels was probably overkill. Two would have been fine.. They had the manual online. Please be welcome to remove my comments (or show them–your choice). Hi, I’m looking at buying a Highlander from Sam’s club and having it shipped to me in California. I have not been able to get in touch with the manufacturer to get a copy of the layout/dimensions to see if it will fit in the space in our yard. I’d really appreciate if anyone’s time if you could share some info on the layout. I KNOW!!!!! I keep praying that there is triple the amount we need, but we are going through them pretty fast. I am thinking that I might be a little grateful that I didn’t win one on that twitter party the other night. My hubby is not the best when it comes to these things and likes to take shortcuts and such. I would want to do it myself. Man that looks like lots of work, but soooo fun 😛 I want one too! we got a much simpler set from step 2, the play up swing set and it took about 5 hours for 2 people to put that thing together. Just understanding the instructions takes patience and time. LOL! the plan is for us to get one next summer. I’m VERY grateful my husband has 2 brothers, a brother-in-law, and brother-in-law’s brother who is a contractor. This way my husband won’t have to do anything more than hand out fresh beers. It will take all of them to stare at it and go WTF in unison. Trust me. Keep in mind that you have to go step by step by step through the first 23 steps other wise you will screw the whole thing up as (much like math) it all builds (no pun intended) on each other. that means no more than two ppeople can eally be working on it at a time. Havign trisha around to pass up boards and hardware saved a lot of up and down and time. That was a god send. OMG- we have the same set and finished the prep on the boards, but havent started yet! Definitely emailing to all involved ‘engineers’ so they know they will need TWO days minimum to put together- THANKS!!! Hint..dont put the bench seats on the picnic table till the top of the table is done or you will have to crawl under the seats to finish the table. just looked at the book- you’re right, your way is easier0 thanks! Plan two full days on a weekend to get the majority of the structure up. You can work the details through out the week. Make sur eyou sort out all of the boards first. ANd make sur eyou have a level and Trianlge Square. It helps. Just know the worse part is answering your kid as to when it will be done. The correct answer is never. The best answer is soon, but it will go faster if you help. Will you hand me that board! Sweet tea and ice cold coke all around! She has actually been REALLY good!! Today when the picnik table finished (ill post pics in the morning), she kept trying to tell us to quiet down so she could eat her apple and raisins in peace. Oh my word! That’s a TON of washers and bolts and stuff. Good grief!!! Okay, you’ve just completely scared me out of buying a swing set. LOL We’d be doing all that for weeks. This is the exact set we are about to buy. Hubby is scared out of his wits to put it together. LOL! It is not so bad once you sort the parts. It makes it manageable and easy to find. Keep the hardware out of the sun. they get very hot, very quickly! A few hours work from Dad and Grandpa for many years play time for Charlotte I’m sure will be much appreciated. Just think on all the happy times she’ll have with friends playing. Sounds like you are going to have everyone from the neighbor playing in your yard with this swing set and the moon bounce. Have fun! To ruin everyone’s fun, my dad does work in the construction field. He has been doing it for over 10 years and carpentry as a hobby his whole life. His skills definitely came in handy! And so did his tools. Thanks Dad! With projects of any size, you are going to have pratfalls like that. God bless them for their perseverance. 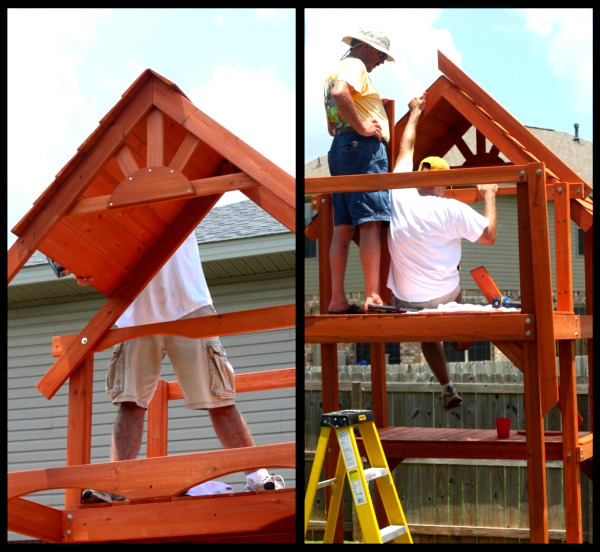 It took my husband and his friend 2 eight hour days to put ours together…and his friend owns a construction company and had special tools to make it easier. I told hubby that if we ever move then the playset will come with the house! Yipes this is like an IKEA trip from hell….all those little screws and bolts! But I’m anticipating the big grin on charlotte’s face when the whole shebang it complete and she’s swinging on it.